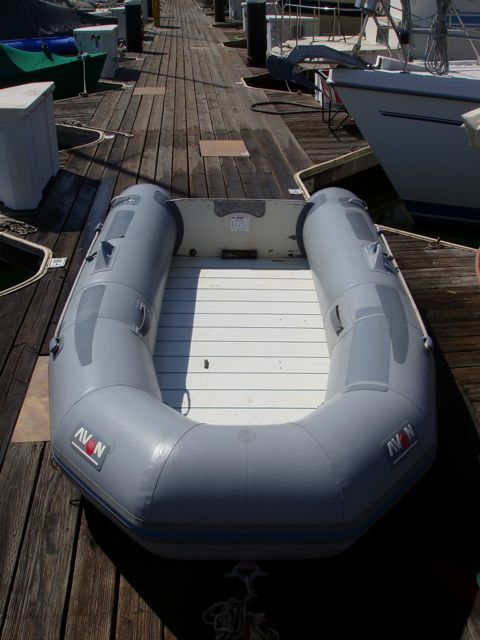 Our New Dinghy and Our New Anchor Light! 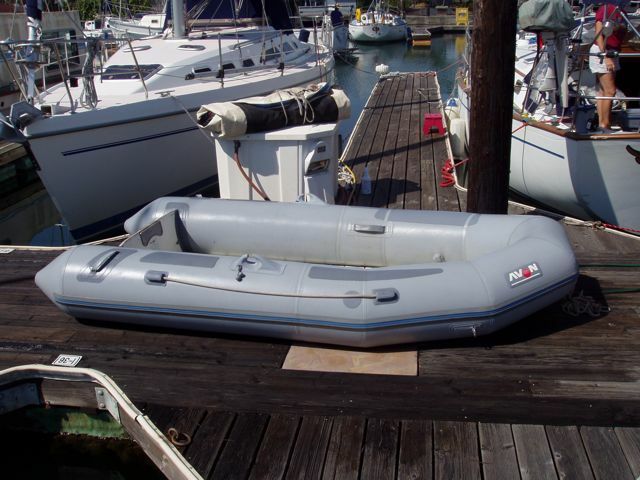 Sal's Inflatables is a local Alameda company that has been selling and servicing inflatable craft and life rafts for a LONG time. Sal, the owner, is a tall man who has been dealing with inflatables long enough to know them much better than one could by reading a book. 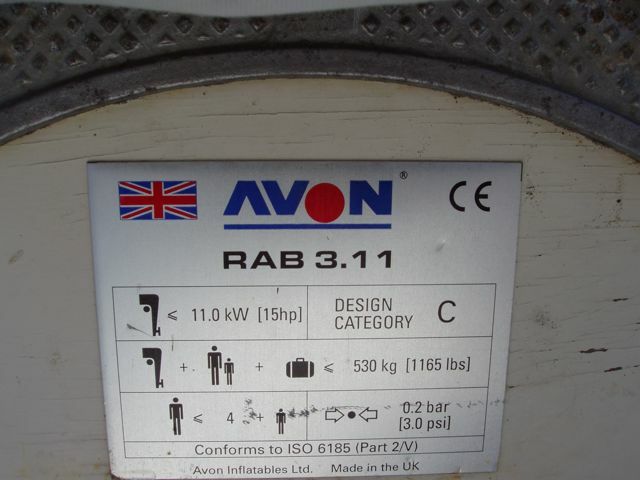 He sold us a used 1998 Avon inflatable dinghy, 10 ft., 5 inches long. It's in great shape and he fixed some minor cosmetic damage, threw in a good pump, a repair kit, and a pressure gauge. He also provided a great deal of good advice on our inflatable. 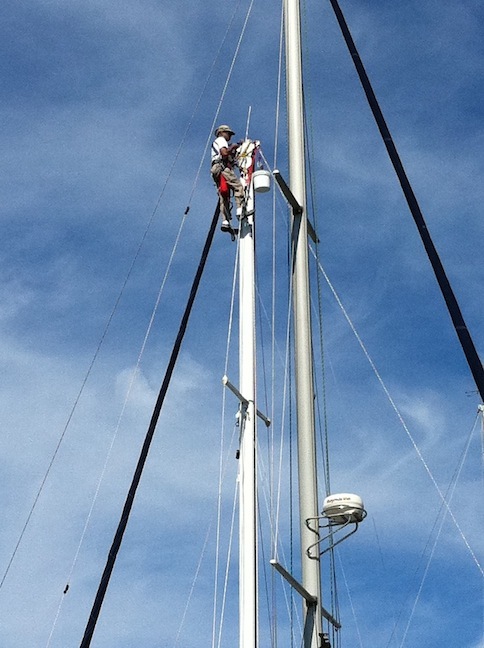 The last two photos are of Bill installing the new anchor light. Quite an arduous task! Our new Avon, cleaned up and ready to go. It has a roll-up floor, making it heavier, but much easier to deploy from on-deck. The dark gray areas are protective patches. Lovely, and not bad for a 1998 boat. Lots of capacity for guests and rum. 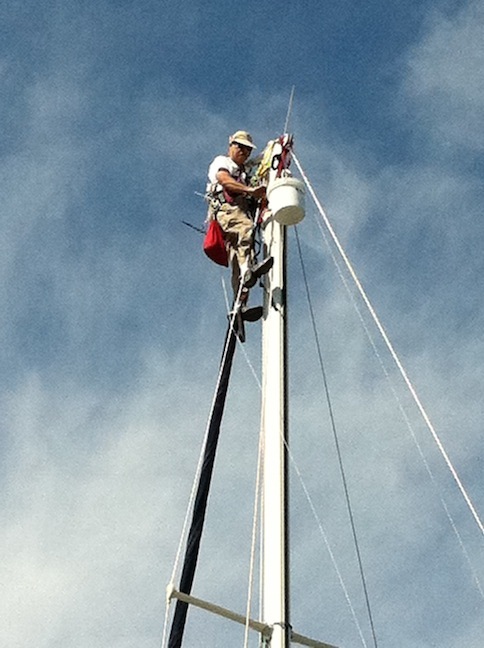 Bill at the mast head, installing the anchor light. Bill working on the anchor light. The white bucket contains all the tools: drill, parts, screwdrivers, etc. The red bag contains all the webbing that was used to construct the various safety systems and "ladder" in which he is standing. This was a three-hour project.